Lawyer, Business Consultant, born in Barcelona in 1959. Sergio has been working in Spain, Latin America and North Africa for more than 30 years. 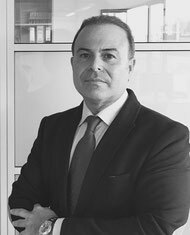 He is a specialist in logistics and international trade and studied law at the University of Barcelona and also holds a Master Degree in Real Estate and Construction Law as well as a Master in Sports Law. Nowadays he advises companies, e.g. insurance brokers, Legal consultant service by phone and many others. Also, he has built some own companies related to the sectors of leather tanning, garment making, meat and fish feeding. As one of the founders and partner he maintains two legal studios based in Barcelona and Buenos Aires.